Stretch marks are a common part of life for many men and women. 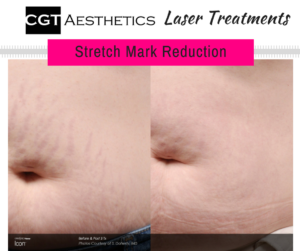 When the skin has been stretched too far or too fast – such as during puberty, pregnancy or weight fluctuations – these unsightly lines appear. Finally, there is a treatment that will reveal smooth and touchable skin. 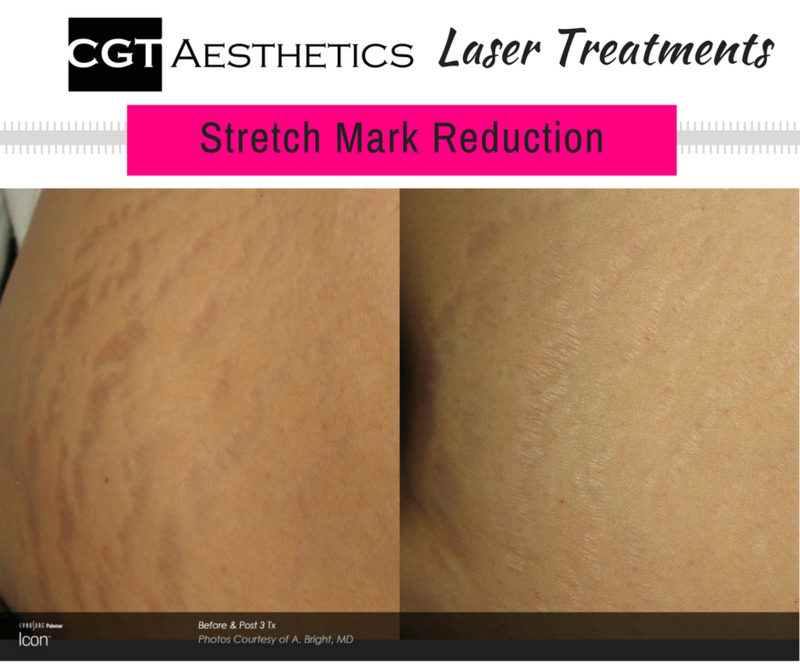 Laser stretch mark reduction at CGT Aesthetics is fast, easy and virtually pain free! Just because stretch marks are normal doesn’t mean you have to live with them! How do stretch marks happen? Stretch marks form in the middle layer of skin called the dermis. The dermis maintains the shape and elasticity of the skin. When the skin expands and stretches to its limit it causes tiny tears in the dermis, but leaves the outer layer of skin (called the epidermis) intact. Connective fibers breakdown, disrupt collagen production and cause stretch marks. This fractional technology delivers pulses of laser light into the skin to target and break down stretch marks. This allows the skin to regenerate healthy tissue in its place, including stimulating collagen growth and healthy skin cells. Over time this results in smoother and more even skin tone. 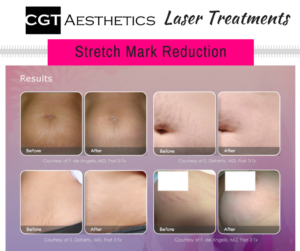 Expect to see an improvement in both the tone and texture of your stretch marks. The treatment can be performed in as little as 30 minutes, depending on the size of the treatment area. Typically you may resume your daily activities immediately following the treatment session. Most people need four to eight treatment sessions for desired results. You may experience a temporary redness and swelling of the stretch marks, which could last a few days. Our Aesthetician Jessica will discuss other possible side effects and the necessary post-treatment care.